The I-80 charrette team, the largest of all six teams with nearly 40 participants (including local citizens, conservationists, county planners, and a major land owner/developer), examined growth issues along the 50-mile, six-lane corridor linking Nebraska’s two largest cities, with special focus given to interchanges at exits 420 (Greenwood/Ashland), 426 (Ashland, Mahoney State Park and SAC Museum) and to a new interchange at Pflug Road in southwestern Sarpy County. Mark Stursma, Papillion planning director, facilitated the charrette. You can download a PDF of the final report of the Interstate 80 Corridor charrette here. Additional nodes identified by the team included Highway 370 (Gretna, Papillion, Sarpy County), Waverly-Highway 6, Gretna (Hwy 31), 180th Street exit (proposed), and the Platte River. Stakeholders identified by the I-80 team included regional users, commuters (including many from Iowa); environmental assets/interests; state parks, recreation users, railroads, developers, agriculture, university, mining, municipalities/counties; future residents/generations; current residents/Class 1 and Class 2 communities; landowners; Omaha-Lincoln residents; and the state economy. Major issues affecting the I-80 Corridor in the face of rapid growth pressures included managing new growth in sustainable ways as well as addressing current sustainability needs and environmental challenges. The team probed utility and infrastructure needs and asked if they were adequate, environmentally compatible and affordable. Could infrastructure keep pace with growth? Related to the infrastructure question, longer-term transportation issues and needs included how corridor communities will finance infrastructure needed to support an anticipated eight-fold increase in commuter traffic in the next forty years. To keep pace, the region and state needs to explore alternative transit systems such as passenger rail service. Continued trail expansion and improvements is also critical for transit and recreational uses. The team expressed concerns about the region’s divergent goals and lack of a regional vision and called for coordinated regional planning, uniform development codes and standards, and a comprehensive development plan. The state and region also need to plan for the funding needed to address infrastructure, economic, environmental and community needs. Interchanges designed to serve as gateways to destinations, and not destinations themselves. A comprehensive regional vision and plan validated through community (city/county/agency) participation. Regional funding, not by tax incentive. Identification and protection of environmental, natural, cultural and historic assets, including preservation of farmland and other open space. Market agriculture as a unique regional asset and encourage the development of local food markets. Protection of the visual quality of corridor through uniform design standards. Economic synergy through community cooperation. The region must act as one economic unit to successfully compete with other urban regions. Maintenance of traffic flow and safety by limiting number of interchanges. Alternate transportation opportunities. Add right-of-way for I-80 and Highway 6 to serve as green buffer and future rail/tram system. Develop conservation subdivision policies to address sprawl and land conversion challenges, including loss of valuable farmland. Emphasize contiguous development. Encourage new growth in towns and cities rather than at exits or other disconnected sites. Challenges to this western end of the corridor included a lack of regional vision and a perception that the world ends at county borders. There is a lack of cooperation and jurisdictional coordination—what is Waverly and what is Lincoln? The subgroup noted an urgent need to protect environmental assets and view corridors, with floodplains preserved for natural or agricultural uses. Further up the road, the Greenwood interchange does not provide good access to the town of Greenwood. Cass County has zoned for commercial at the exit but hasn’t adequately addressed regional water and sewer issues. In addition the subgroup noted conflicts created by property value and tax inequities, and called for the creation of equity from value-regional/shared benefits. This subgroup suggested that this fast-growing area is losing its identity and needs to identify landmarks and aesthetic assets and consider itself a gateway to Highway 6 scenic routes, parks and other attractions. Because considerable development has occurred at this location apart from the town of Gretna, it was recommended the area should be preserved as an attractive gateway and future growth discouraged. This subgroup focused on the Platte River Valley as a unique asset to be protected and preserved. It recommended preservation of the valley ridgeline, Loess Hills environments, the preservation and identification of endangered species, prime farmlands, and new parks and public assets. It called for prioritization of land use through zoning (cluster housing, agricultural, habitat, public use), development of policies for conservation subdivisions, local services from communities to serve all new development, and promote contiguous growth to avoid excessive land conversion and to limit unnecessary costs and investments in new utilities and other services. A general consensus suggests that new development near I-80 would ideally be set back beyond a minimum 300-foot-wide green buffer and would be designed in an attractive vernacular to blend into rather than stand out from the natural surroundings. The design would also include right-of-way for a passenger rail line (or existing rail lines could be used). New development could include a research park along the south side of I-80 between 180th Street and Highway 31 or at sites near Ashland or another community. There was an overall emphasis that new development should be contiguous to or supported by existing communities to discourage the development of “lifestyle centers” at interchanges that would compete with existing communities. 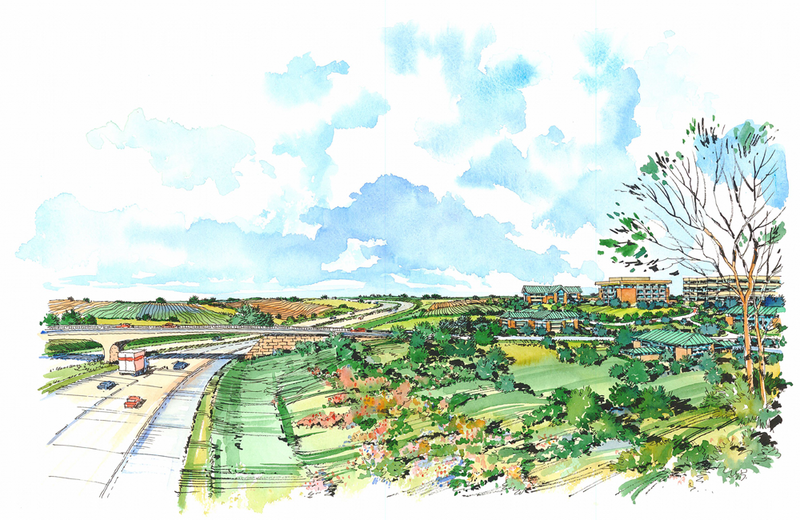 At sites such as the Gretna interchange, where development has occurred beyond city limits, it was suggested that a renewable energy district be created, and that new design standards include a green buffer along I-80.